Quaking aspen is a deciduous tree native to the cool climates of North America from Newfoundland across the subarctic to Alaska and British Columbia, south to Pennsylvania and Iowa, and to the mountains of California, and New Mexico into central Mexico where it grows on woodland edges, and in old fields and clearing in a variety of soils. It is a member of the willow family, Salicaceae, that also includes poplars and cottonwoods. Usually growing in clones, it is single stemmed and has smooth creamy white bark with black horizontal markings and knots. The deep green leaves are rhombic to ovate in shape , up to three inches long, and turn clear yellow in autumn. The petioles are long and flattened and facilitate the fluttering of the leaves in the wind, giving rise to the common name, quaking aspen. Small gray-green male and female flowers appear in separat pendulous catkins one to three inches long on different trees before the leaves appear in spring. Female catkins give way to strings of capsules with about ten tiny seeds with cottony material that facilitates wind dissemination. 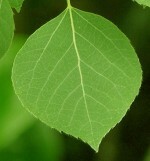 Quaking aspen is moderately drought tolerant, very wind tolerant, but intolerant of pollution. Large clones of are a magnificent sight in both summer and fall and single trees are an excellent choice as a specimen, shade or patio tree, or as a screen or windbreak where climates are cool; quaking aspen does not do well in hot climates. The genus name Populus is the Latin name for the tree. The specific epithet tremuloides comes from the Latin word tremulus meaning trembling and the Greek word eidos meaning likeness referring to the similarity of the plant to the European species P. tremula. Care: Grow only in cool areas; disease prone especially when grown out of its preferred temperature range; short lived.